Based on a friend’s recommendation, we began a history curriculum called The Story of the World. I’m sure that there are many other wonderful history curricula out there, but we’ve grown to love this one. It’s very simple: The four Story of the World textbooks (Ancient Times, The Middle Ages, Early Modern Times, The Modern Age) are designed to be read aloud to children in grades 1-5. Each text has a corresponding Activity Book, with reproducible worksheets, suggested activities, and supplemental bibliographies. These books are so well written that, although they are densely packed with information and have very few illustrations, they hold my daughters’ attention completely. Their scope is also impressive; for instance, our study of the Middle Ages wasn’t limited to knights and castles in Europe, but spanned the globe, discussing what happened from 500-1500 AD in India, Asia, South America, and the Pacific islands. I’m not an amazing teacher, nor are my children some sort of historical genius prodigies. The fact is that history, when presented well, is fascinating! It’s a story about real things that have happened, and what child doesn’t love real stories about the past? My daughters also enjoy the predictable patterns and lessons of history. They can now tell you that when Empires get too large, they’re going to fall apart. Or that when ruling power passes down through a family, you’ll likely end up with a weak and ineffective ruler somewhere down the line, or else the kids will squabble and make a big mess of things. Or that oppression and injustice always come back to bite you in the end. “Oh no! Bad idea!” they’ll call out, as we read about yet another monarch making poor choices. I’ve been shocked by my children’s enthusiasm. Our history lessons provide fodder for dinnertime conversations (and back-talk! ), inspiration for dress-up games, and names for stuffed animals (we now have a plush tiger named Charlemagne.) Best of all, my daughters began extending their love of history beyond what we were studying at the moment. “I’m really interested in the civil rights movement,” my eldest daughter said to me one day, apropos of nothing. 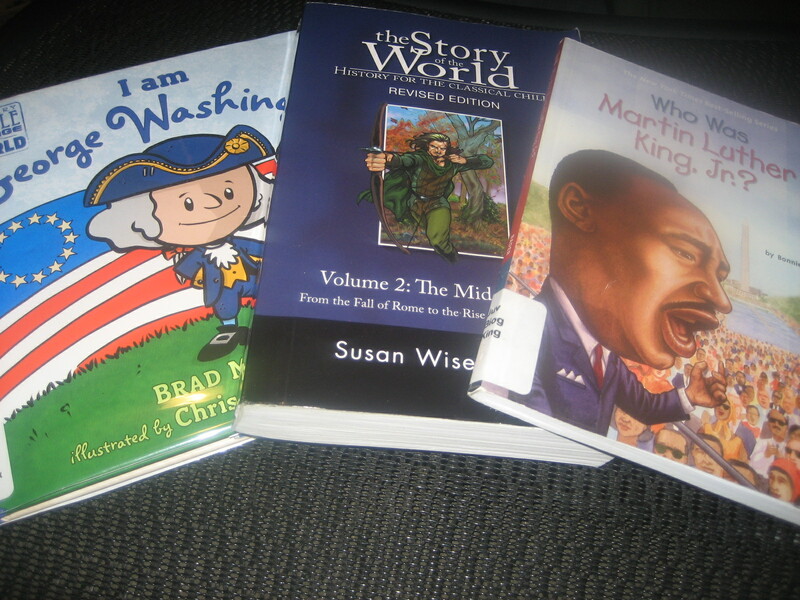 So, the next time we went to Ilsley Public Library, she checked out biographies of Martin Luther King, Jr. and Rosa Parks. Then she moved back in time to Abraham Lincoln and the Civil War, and is now tackling the American Revolution. In fact, a major reason why this daughter asked to be homeschooled for 3rd grade was when she learned that the 3rd grade at her elementary school wouldn’t be studying history, focusing instead on science and gearing up for a big Vermont history unit in 4th grade. She didn’t want to spend a year without history. Science is important – in fact, it’s one of my favorite subjects to teach. I am all in favor of the recent emphasis on STEM (Science, Technology, Engineering, and Mathematics) education, especially for girls. But I wonder: Are we making an equal push for history education? When I think about my daughters’ school experiences – and my own – it seems that most elementary schools eschew history in favor of studying the cultures of various countries. Or else they’ll drop in on a single time period (“The Middle Ages,” or “The Pioneer Days”) and explore it in a vacuum, with heavy emphasis on crafts and food. A more holistic, narrative, linear study of world or American history doesn’t happen until high school, if at all. But I wonder if, like languages, history is best learned when young. This is not a critique of elementary schools; they have their hands full, and history is vast and messy. Nor is it a promotion of homeschooling, which certainly isn’t for everyone. I’d just like to encourage us to consider the benefits of introducing our children to history early on. You don’t need to homeschool to teach your children history; The Story of the World is available for about $15 (as are other, similar books) and could be used as a bedtime read-aloud. You don’t even need to spend a cent: The children’s room at Ilsley Public Library has an extensive collection of Grosset & Dunlap’s Who Was biographies for the middle grades, and the “Ordinary People Change the World” series for younger readers, as well as numerous other biographies and history books. And then there’s Hamilton: Lin-Manuel Miranda’s award-winning musical about the life of American founding father Alexander Hamilton sets early American history to a catchy soundtrack, and has provided many families I know with fodder for historical discussion. (In our house, it was, “Why is George Washington rapping?! ?”) The show does contain language and mature themes (I downloaded a “clean” version, and still limit which songs my children hear), but it’s done wonders for reintroducing us all to the ideals upon which this country was founded. Yesterday we commemorated Dr. Martin Luther King, Jr. and the civil rights movement; in a few days, we will inaugurate a new American president whose election has prompted intense emotion and discussion. It seems to me that, if nothing else, a worthwhile response to both of these events would be to talk about history with our children. History gives children a sense of identity; in order to know who we are, we need to begin with where we came from. History also gives children a sense of power; having read biographies about people who influenced the course of history, my daughters are much more likely to stage protests, make signs, or put their opinions in writing. For instance, they have become passionate about the importance of supporting local businesses: They are now making signs to encourage people to shop at the Vermont Book Shop, and they’ve contemplated pooling their allowance to buy Whirlie’s World so that it won’t shut down. They believe that they can make a difference. In short: When we teach our children about history, we provide them with context, and we provide them with hope. And when we ignore history, we do so to our peril.